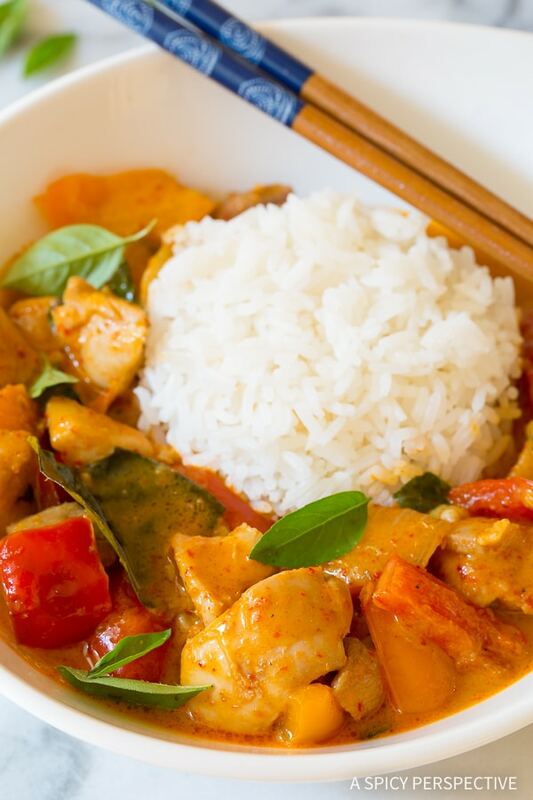 The Best Thai Panang Chicken Curry we’ve ever made. Cancel your takeout order and give it a try! That is a question I get a lot. Especially when I meet new people and they find out I write a food blog. Although my answer is likely to change on any given day, swayed by my current cravings, Asian cuisine is always at the top of my list. There are a few Asian dishes I just cannot get enough of. Dishes that make me squeal with delight at the sheer thought of them… Vietnamese Bun Cha Gio Bowls, Thai Pad Kee Mao, and Korean Bulgogi to name a few. Many of these are meals that can be ordered at Asian restaurants. Yet I find they are often even tastier when made at home. Thai Panang Curry is another dish I swoon over. It’s rich and spicy with a distinctly unique flavor from the addition of kaffir lime leaves and panang curry paste. I could eat this every day of the week and never get tired of it! To top it off, the fragrance of a good Panang curry is so intoxicating, it should be bottled in my humble opinion. I have ordered Panang chicken curry numerous times at Thai restaurants, and experimented with homemade version nearly as many times. After much testing, I have finally come up with a recipe I feel is The Best Thai Panang Chicken Curry I’ve ever made, and possibly the best we’ve ever eaten. I know that sounds braggy, and I do apologize, but this recipe is flipping amazing! Just taste it and you’ll forgive me. 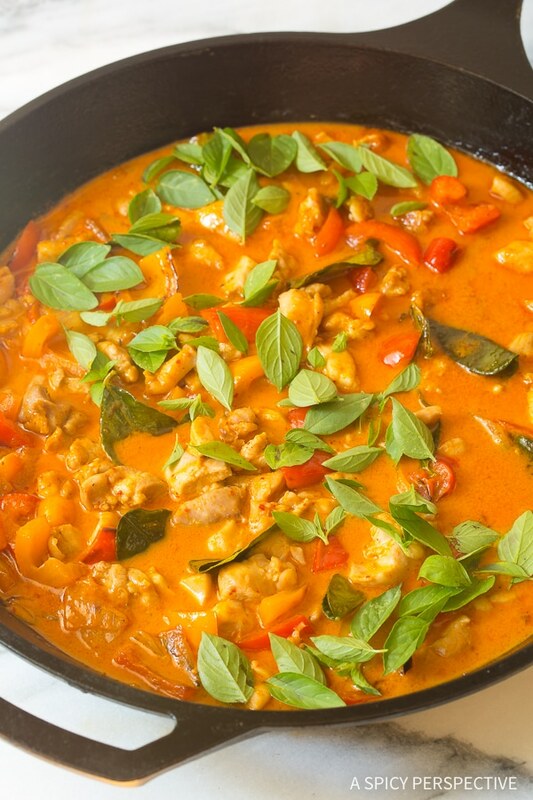 The Best Thai Panang Chicken Curry is extremely simple to make. The catch is, you will most likely have to go to an Asian market to gather the ingredients. But trust me, The Best Thai Panang Chicken Curry recipe is worth the trip! If you happen to live in a large multicultural city, your standard grocery stores may have everything you need. If not, google asian markets… Even small towns usually have one. 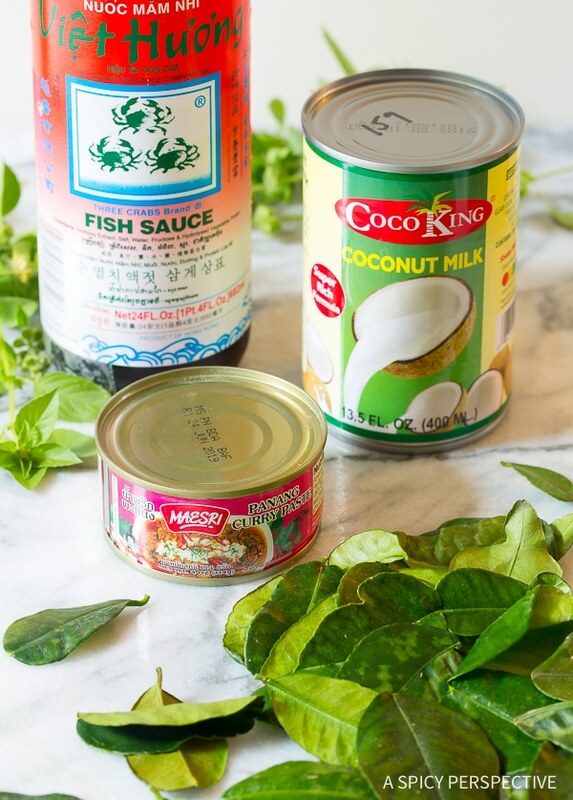 Once there, hand your grocery list over and ask the clerk help you find the best brand of panang red curry paste, thick coconut milk, and fish sauce. Be sure to also pick up Thai basil leaves and kaffir lime leaves. You can substitute other types of basil, however the kaffir lime leaves cannot be replaced. The flavor is too unique to swap another ingredient, or to leave it out. The Panang curry paste has some kaffir lime leaf in it, but it’s not enough. When I go to the Asian market, I usually stock up on panang curry paste, the thickest coconut milk I can find, and kaffir lime leaves. Fresh kaffir lime leaves can be frozen for longevity. They do turn dark in the freezer, but retain their vibrant flavor. Panang curry paste is a type of red curry specific to Thailand and Laos. It is less spicy and more aromatic than standard red curry paste. In a pinch you could substitute red curry paste, but the flavor will not be quite the same. 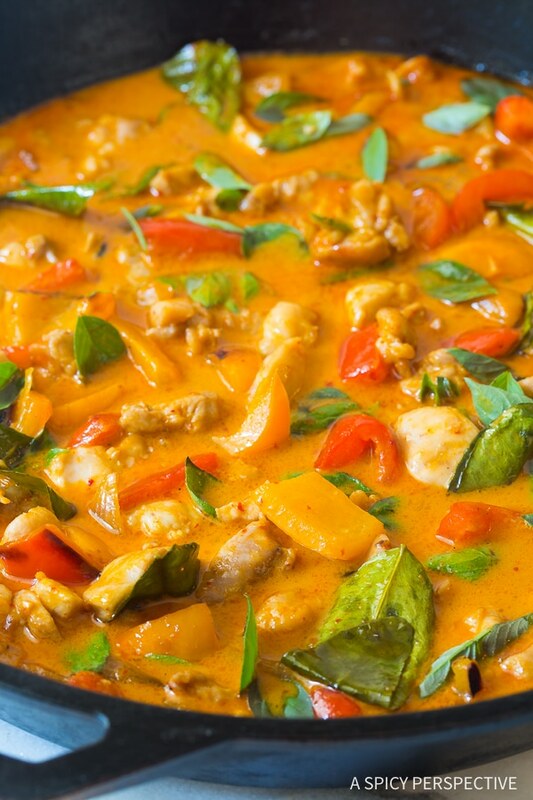 Ready to make The Best Thai Panang Chicken Curry you’ve ever tasted? Start by cutting chicken thighs, onions, and bell peppers into bite-size pieces. Then crush the kaffir lime leaves to help release their oils. They are tough little leaves so smash and twist away, until they smell very strong. Sauté the onions, peppers and garlic in a large skillet. Then add the panang curry paste and a spoonful of peanut butter to the center of the pan. Sauté the curry for a couple minutes to intensify the flavor. Then add the kaffir lime leaves, coconut milk, fish sauce, and chicken to the pan. Simmer the curry until the chicken is cooked through and the sauce thickens. 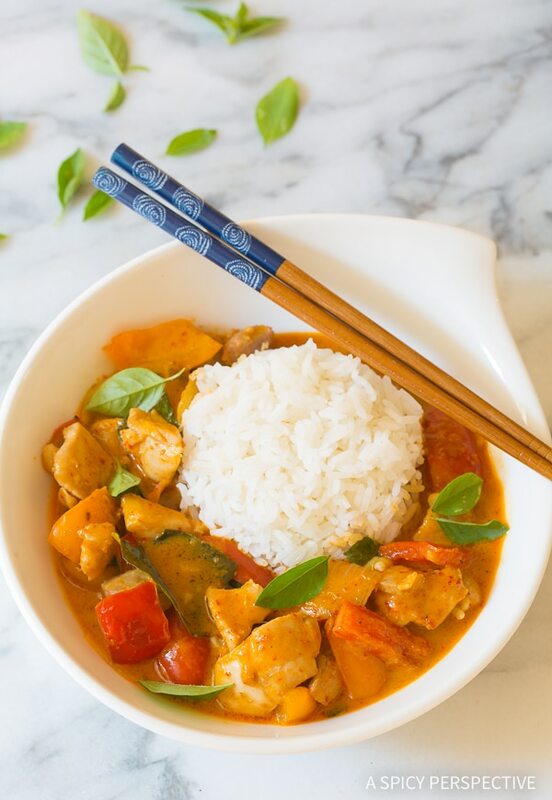 Stir in Thai basil leaves and you have a dish worth drooling over. Bold, fragrant, and oh so delicious! You local takeout joint has nothing on The Best Thai Panang Chicken Curry. 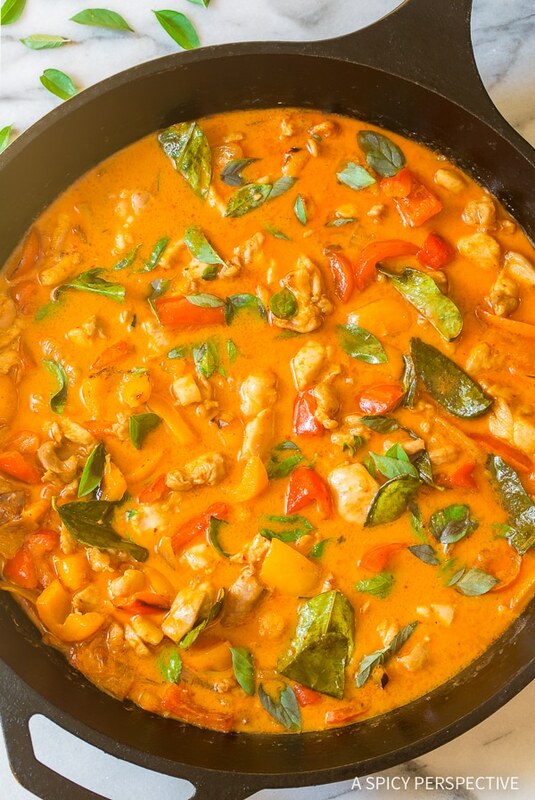 The Best Thai Panang Chicken Curry Recipe - The most amazing red chicken curry we've ever made! This light and healthy dish is better than any takeout option out there, and it's easy to make. Cut the chicken into bite-size pieces. Chop the onions and peppers into rough 1-inch pieces. Mince the garlic. Then crush the kaffir lime leaves to help release their oils. Place a 14-inch skillet (or wok) over medium-high heat. Add the coconut oil. Once the oil melts, add the onions. Sauté for 1 minute, then add the peppers and garlic. Sauté another 2-3 minutes. Move the veggies to the sides of the skillet and add the panang red curry paste and peanut butter to the center of the pan. Sauté the curry for 2-3 minutes to intensify the flavor, moving around the pan. Then add the kaffir lime leaves, coconut milk, and fish sauce. Stir to blend. Stir in the chopped chicken and bring to a boil. Lower the heat and simmer for 10-15 minutes, until the chicken is cooked through and the sauce thickens. Stir occasionally. Remove from heat and stir in the basil leaves. Serve with rice, quinoa, or noodles. There are some ingredients that may need to be purchased at an Asian food market, but this recipe is worth the trip! Most likely: panang red curry paste, kaffir lime leaves, thick canned coconut milk, fish sauce, and Thai basil. Kaffir lime leaves can be kept in the freezer. They turn dark, but retain their flavor. Kaffir lime leaves stay a little tough, even after cooking. You can eat them, eat around them, or take them out after cooking. This truly is the best! Thank you for sharing. 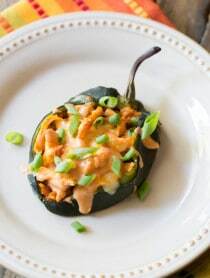 So versatile, too, if you keep the sauce ingredients the same, but can easily change up veggies with or without meat. I buy the dried lime leaves and curry paste at Amazon. What did we do before Amazon?? Thank you for the delicious recipe, Sommer! I spent a month in Thailand and Panang Curry was always my favorite. This recipe is the closest I’ve come to a taste of Thailand since. One question for next time (because there will most definitely be a next time)…all I could get my hands on were dried kaffir lime leaves. For dry, should I still crush them with my mortar and pestle? Should I be using more or less than 12? Totally fine if you haven’t made with dry and can’t answer. Just thought I’d ask. Going to make this tonight? Is it possible to substitute peanut butter with tahini? Can you use a can of unsweetened coconut cream instead of thick coconut milk? Just made it tonight (for tomorrow) in the Instant Pot so haven’t eaten yet! If the store employees don’t know which coconut milks are the thicker brands, which do you recommend? Thanks! Seriously incredible! I thought it’d be too good to be true, but this recipe is phenomenal. I even forgot the thai basil at the end and it was still so great. Otherwise followed the recipe exactly. Restaurant quality. Best curry ever!!! Except a full small can of the penage curry paste was too hot for us. I used 1/4 the can next time and was amazing- for all you who like a little Spicey, use 1/4! Thank you for the inspiration. This has been by far the BEST recipe for Penang Curry. The authentic ingredients listed above really do make a difference! It took me about a week to collect all my sauces from Amazon and run to the local Asian market. Once cooked my curry had a nice spicy flavor (maybe too spicy for some) however there was quite a bit of salt. 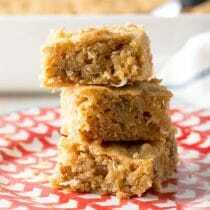 I added a bit of brown sugar (3 tsps) and peanut butter (2 tsp) to tone it down. 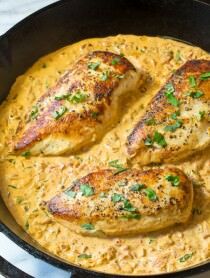 I also used unsweetened coconut cream since I like my curry to have a thicker sauce. I’ll still enjoy Penang curry at a restaurant but this recipe is certainly a staple on the bi-weekly dinner meal. Also love how quickly it came together. Thank you. Thank you. Thank you! I just wanted to double check the amount of curry paste to put in. Every other curry recipe out there calls for 1 or 2 tbls only. This recipe says the entire 4oz can. Is that correct? The whole can? I just want to make sure. It is… However, if you find the curry paste you buy to be super salty or hot, add half the can, then add more as needed. Some brands are more intense than others. I live on a small Canadian island and can’t get fresh basil or lime leaves. I hope too get dried. Do I use the same quantities? I have ordered curry paste from Amazon. So looking forward to trying this. Yes, on the keffir lime leaves, use the same amount. Dried basil is usually crushed. 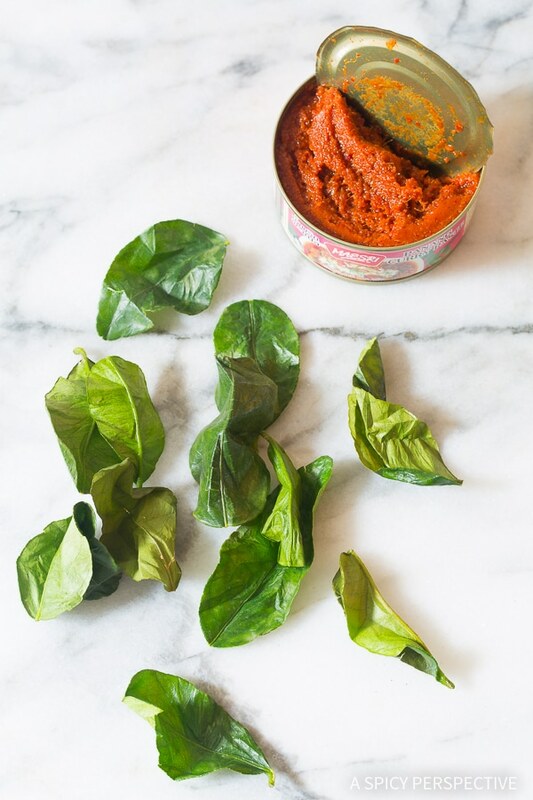 For the basil, I would use about 1 – 1.5 tablespoons. I’m trying to understand the nutritional label. With 3 tablespoons of fish sauce the sodium should be waaaaay higher, even when dividing into 6 servings. Can I prepare this ahead of time and freeze? I have had success freezing this recipe. Just be sure to thaw it completely at room temperature before reheating. That helps preserve the texture. Wow! We made your panang curry recipe yesterday for a dinner with 8. We doubled the recipe and had a small amount of leftovers. We substituted limon zest for the Kaffir leaves which appearded to work out beautifully. We cooked the sauce in a slow cooker as was suggested and then added the vegetables ( peppers, onions and broccoli) 30 minutes prior to serving. We also sunstituted Shrimp ( 2 kilos) for the chicken which was fabulous! Awesome recipe! Can’t wsit to do it again! I believe that is sweetened… Try to find unsweetened coconut milk if possible. Very nice! Husband said, “I don’t know what you’re cooking, but it smells amazing!” Think next time I’ll work in more veggies and add cilantro to this amazing sauce. Thanks for helping home cooks make authentic tasting food! Just made this tonight and it is legit!! I feel like I’m in a Thai restaurant right now. Everything was pretty easy to find at the international market. The only thing I changed, was I pulled the kaffir lime leaves out once I felt like there was enough flavor. I think it would have been overwhelming had I let them stew in there for too long. My leaves were also very large so maybe that had something to do with it. It came out perfect though. I made this tonight and it is amazing!! Thank you so much for sharing this recipe!! We live 1-2 hours away from our favorite Thai restaurant. I think it’s depends on the fish sauce you use. I bought a fancy one the first time I made it in 3 tablespoons was just fine. this time I bought a cheaper fish sauce and it was too salty for me to even eat which was disappointing. I checked the ingredients and it said it had 65% sodium it in! So be sure to check before using it. Has anyone figured the fish sauce to perfection? 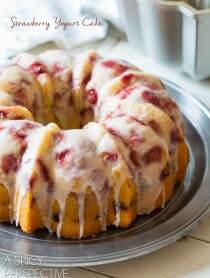 I’m making this today, and my husband is a tuff critic. Thanks. 3 tablespons fish sauce it is reeeally salty. I had to adjust it by adding more peanut butter…but still too salty for me. Will make some adjustments next time, but this recipe was a great reference. Super easy to follow and accomplish! Omitted the bell peppers, but added some roasted cauliflower, zucchini and broccoli to fill it out. Ate multiple times throughout the week for lunches, and still not sick of it! Was worried it would have a peanut-y flavor from the peanut butter, but just added a nice subtle umami flavor. Will definitely be making again! Sorry if this question has been asked before, but do you have a suggestion for a substitute for the peanut butter? Severe peanut allergies in our house. Thanks in advance! Are you allergic to tree nuts? If not, you could use cashew butter or almond butter. However, check the panang curry paste’s ingredients. It sometimes contains peanuts! Just bought a tin of that panang curry paste. Can’t wait to try this recipe this week! This was delicious! Thank you for this recipe! I used green beans and carrots instead of peppers. I wasn’t really sure how to crush the kaffir lime leaves so I tried to pound the in my mortar and pestle and then I just sort of twisted them in my hands. I could smell them like you said, so I guess it worked. I love making Thai food and this recipe was fantastic! I couldn’t find the fresh lime leaves at the Asian store but used dried ones instead and it was still fabulous. Definitely wouldn’t want to leave them out…they added a great flavor to the dish. Will make again! Did you use 12 dried? You don’t have to first brown the chicken? No, you are actually poaching the chicken in the sauce, so it’s extra soft. May I use a can of coconut cream I got at the Asian market instead of the milk? How can the sodium count per serving be so low? Our recipe form has an automatic nutritional calculator built-in, but I have found that sometimes it’s wonky. I just re-ran the recipe and the sodium did come out higher this time. Love it, made as directed. Next time, the only thing Ill do is cut down on Kaffir Leaves. I think they were too overpowering. I do absolutely love them though and without a doubt, they are key ingrefient. Maybe my leaves ae bigger than yours?!! Thanks for sharing. Thanks for this great and easy recipe. Unfortunately I can’t get hold of the basil leaves but even without that it is a great dish! To get enough veggies, I make it together with your thai quinoa salad (with a reduced amount of sesam oil in the salad). I have made this a couple of times now…this recipe inspired my first serious foray into the Asian market in the next town over (which is next to the Indian Market, a tale for another day 😍) and now I am addicted. 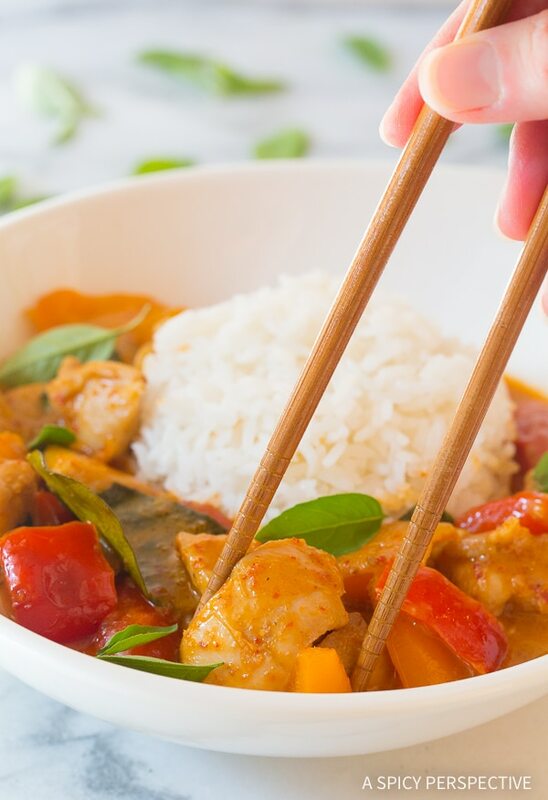 This recipe is simple, delicious, and easily rivals the red chicken curry from the popular local Thai house (and is better than some others we’ve tried!) The Panang Red Curry paste and kaffir lime leaves really are the secret to the amazing authenticity of the dish. Even my son, a tough customer who spent a month in Southeast Asia this past summer, gave it the stamp of approval. Two thumbs up! Followed the recipe exactly but added a bit of chili powder just because my son is a madman and likes it blazing (the local Thai restaurants refuse to give us *hot* – we’re too blond and white and get what’s closer to medium no matter how spicy we order. 😂) But whatever your heat preferences, this is delicious! Will ground kaffir leaves work too? Also, my daughter is allergic to seafood. Can I substitute soy sauce for the fish sauce? My son is allergic to peanuts. Will it make much of a difference if I don’t add the peanut butter? You can skip it, but check your curry paste as well. Sometimes it contains nuts. We made this tonight and will DEFINITELY be making it again! It is the perfect amount to spiciness, and had all of my favorite flavors. We used the sauce pictured in the blog and could not have been tastier! We just about doubled the kaffir lime leaves and added shallots with the garlic. So so flavorful! Followed the recipe as written and the dish came out fantastic. I found the majority of my ingredients at the local Korean market H-Mart. Most complain about the entire can of curry paste being to spice, I actually added 1/2 tsp red chilli flakes and for me that gave it a nice intensity to balance the hint of sweet. No more will I give my money away to the local Thai restaurant so often for such tiny portions. Made this yesterday and it was delicious. Only change was to add in a couple of chillis for spice but otherwise followed to the letter. Easily one of the best meals ive made, thank you. Really phenomenal. Restaurant quality. Next time I may use 3/4 of the can of panang curry paste because it was a touch spicy for my husband but we both still loved it. I used unsweetened coconut cream because I didn’t know what “thick” coconut milk meant. It worked well but i’m not sure it was correct. I have been making Panang chicken for a few years with a curry base. This one added so much depth and flavor! The peanut butter was the kicker, that was missing in my prior attempts. Wonderful! Absolutely! You should still sauté the onions and peppers in a skillet first. Then slow cooker on high for 2-4 hours. I tried your recipe however my dish turned out slightly bitter. I used red curry paste as I could not get the panang curry paste. It was spicier. I am not sure why it tasted bitter. I’ve made the recipe twice. I LOVE IT. The second time I made it, I was added bell peppers, thai basil, and fish sauce. I still used tofu and 3 thai peppers. It was even better this time. I did take care to remove the kaffir leaves after simmering and before adding the thai basil. I found the kaffir flavor too strong the first time I made it when I tried to eat around it. It was harder to avoid because of the the added spinach. Anyway, this recipe is awesome, spicy, and really hits the spot. I cook for one so I was able to have this for 5 extra meals (dinner or lunch) which was perfect for meal planning. Definitely added to my rotation when I’m craving thai food. This recipe was delicious!!! This was my first try experimenting with this meal. We ate this meal at a restaurant last night and I was determined to prepare it at home. I added shrimp as well. Is My food was just as good-if not better than the restaurant. Thanks for this amazing recipe. I just made this curry and it is totally delicious!! It is the best curry I have ever made and rivals any Penang Curry I’ve eaten in Thai restaurants an I’ve eaten quite a few! It was spot on! Delicious! Tastes just like restaurant thai chicken panang! Impressed my dinner guests. Forgot to say, I used 1 tbsp fish sauce and used 1/2 can more coconut milk to cut the spiciness, great recipe, ty. YAY!! I’m so very glad you liked it! i live in a small town and the nearest Asian market is 3 hours away. I can only find dry kiffer lime leaves on Amazon. Would they work. I did find thai basil yea. I also have to order the curry but that is ok. Yes, dried kiffer lime will work if you can’t get fresh. Good luck! I will use dry leaves, also. Do I use less or the same amount and do I leave them whole? With dried herbs you usually use 1/3 the amount of fresh. I made this recipe last night. Followed it to the tee but I do have a large family so I essentially doubled all the ingredients with the exception of the coconut oil and used 1.5X veggies. I did use two cans of curry paste and the kick, though too much for most, was just right for my family. 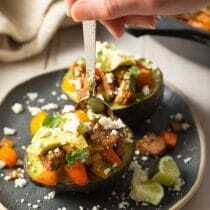 The taste of this recipe is identical to our favorite Thai restaurant in Houston(also the highest rated in the Houston area), however its located 20 miles from us. No need to go back to the restaurant just for panang curry ever again. I tried this out after becoming tired of paying $14 at my favorite thai place every time I wanted a fix of coconut curry. Pretty on point except 12 lime leaves seemed a bit too much for me. Next time I’ll probably use half. And I agree with others that it’s safe to use 3 teaspoons of fish sauce instead of 3 tablespoons. Heat can be adjusted to your liking by controlling how much of the panang paste you put in. Started with half and worked my way up to about 3/4 of the can. Excellent recipe. Extremely impressed with how everything turned out. Added mushrooms and broccoli instead of chicken to make it vegetarian. Amazing recipe! My only suggestion is half of the Panang Curry. Super spicy with just that amount! Plus I only used 1/3 of the fish sauce and we used chicken breast meat. Finally, I chopped the lime leaves super small as to not pick them out. A trick I researched was to put the leftover curry paste into a freezer bag and then flatten it. Works well because I now also have a huge bag of frozen lime leaves to go along with it next time! Cant wait to try it again with more fish sauce, thank you! Made this last night and the recipe is spot on. I made sure to hunt down the Maesri panang curry paste and the Three Crabs brand fish sauce which made all the difference. I didn’t find the Coco King coconut milk so I used another good brand of thick unsweetened coconut milk. Added bonus was that it was easy to make on a weeknight after work. Loved the taste except it was very salty. And when I say salty I mean to the point of beeing almost imposible to eat even after I added the double amount of coconut milk (ended up with trice the amount and added extra currypaste). I mesured exactly according to your recepie but have to wonder if it should be 3 teaspoons and not tablespoons in the recepie? 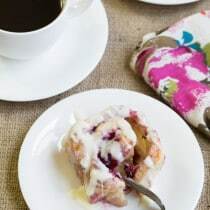 I have to agree that this recipe was absolutely amazing!!! I will make this one over and over again!! I have been waiting for this recipe all my life! Thank you!!! I actually used Massaman paste as I find that a little less spicy and only used about 3/4 of a tin, but it was amazingly delicious!!! Should have mentioned I only used 2 tbsp of fish sauce and 1 tsp of brown sugar after tasting. Hello, I’ve had a really hard time finding thick coconut milk. Can I use coconut cream instead? Wonderful taste…I miss my favorite San Diego Thai Restaurant Panang since moving several years ago back to Ohio. I have to drive 45 minutes to the Asian market to stock up…but well worth the trip. Added a little more spice (we like it hot) with thai chili peppers. This is almost exactly like I remember it being. Thanks for your recipe. I will make it every time I have a need for Panang. Followed this to a T, but raised my brow when it came to 3 tablespoons of fish sauce. I thought it would be too salty and I was right. The curry was almost inedible and I tend to like my salt. Luckily watering it down a little helped, but next time I’ll probably only add 1.5 or 2 tablespoons of fish sauce. The flavor is amazing though, the kaffir lime leaves really make a difference! I used 1TBSP and half the amount of curry paste, and it was still too salty. This dish reminded me EXACTLY of the panang curry I used to get from my favorite childhood restaurant. I altered it slightly though – I tore up the tough lime leaves into little pieces (they’re easier to eat that way). Also, I added another half can of coconut milk, which made it perfect (maybe because I didn’t get the extra thick kind – couldn’t find it!). When I added the extra half can, I didn’t shake the can first, and only took the thick stuff that had settled at the top of the can. The Asian store near my house had the exact brands you posted! This recipe was phenomenal, especially since our local Thai restaurant is closed while the owner’s family visits relatives back home. I added 2 chopped longhorn peppers for extra spice. This really impressed a lot of foodie! I doubled the portion as I needed to serve 13 people and it worked out perfect. Wonderful recipe! Made it twice, the second time with Shrimp. I substituted lime zest from one lime and added twice the fresh basil. Really wonderful flavor. My supermarket didn’t have the Penang curry paste so I used Asian Gormet Red Curry paste and it worked well! Hi I can’t see the exact recipie here? How do I know how much of everything to put in? Sorry I found it I’m blind! I can’t wait to try this!! I love this recipe – I don’t have it very hot so put way less curry paste in, but the flavour was still delicious. I’m looking forward to making this recipe this week. Can you please advise on best way to make it “hotter” — red pepper flakes, or something else? Hi there! Make sure to taste your curry paste before adding more heat. Some brands are distinctly hotter than others. Then yes, I would add crushed red pepper. Very Good. We also added in some Thai eggplant. Forgot to add my stars! The flavor is SPOT ON! It tastes like the panang from my longtime favorite Thai restaurant. I couldn’t agree more with the other commenters on the curry paste to coconut milk ratio. Using the entire can of curry paste is VERY spicy (this coming from someone who considers herself to be spice intermediate). To be safe, use half the can of curry paste to begin with… if you feel like you could use a bit more spice, add more in as you see fit. Other than that, bravo! I’m going to start making this in bulk batches. Holy cow! I made this last night and my kitchen smelled like a Thai restaurant. The flavors in this dish rival any panang I’ve had in any Thai restaurant. Even before tasting it, my wife and I knew it was a winner, just from the smell. The Kaffir lime leaves and the fresh Thai basil (I got it right from my garden) make this dish as authentic as it comes. And it’s dead easy! This will go into my favorites folder in recipes…….. I forgot to rate it on my last post. Whoops. I made this last night and it was fantastic! The curry paste makes a huge difference. I too have always sworn by this brand. I have never thought to add peanut butter. 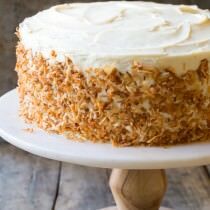 I always just add crushed peanuts to the top, but I loved it! This will be my new go-to panang recipe. Thank you so much! Love this!! Added some fresh lime juice as well as some fresh ginger (and reduced spice for little kids)! Thanks for the delicious recipe! I made this recipe exactly how it was written but mine came out super thick and so spicy. It seems to me like it was wayy too much curry paste. However the brand I used was Mae Ploy and I dont know if that is just different.. I was sad, yours look so good. Any suggestions? I use mae ploy and only use half a tablespoon of curry paste to a tin of coconut milk – you can always add more, much easier than taking it away. I made this today, it was great. I ordered the same panang curry paste you used from Amazon, and I also ordered dried kaffir lime leaves from Amazon as well as I didn’t want to deal with trying to find them at the market. They definitely added a lot of flavor. I did however pick them out as best I could after, wasn’t sure eating one would be very pleasant. How would you recommend making this dish like a level 5 spicy! I love my curry spicy! Thank you! Is Kaffir lime the same thing as kefir lime? I believe so. It’s possibly just a different spelling? They are thick, waxy, and usually have two leaves attached on one stem.